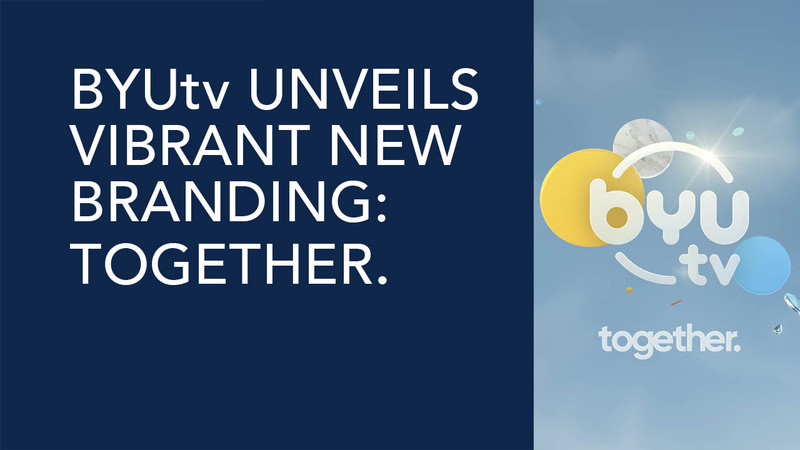 Today, BYUtv celebrates the release of its new vibrant branding! The new logo, tagline, and brand design reflect the fresh direction of the network: to be the family entertainment brand that young people want, parents trust, and which families enjoy together. "We believe in the power of family and in creating an environment that encourages kids and their parents to spend time together," said Michael Dunn, managing director of BYUtv. "Our new brand recognizes the connection that can be created as we come together not just as families, but also as communities and humanity." Created in partnership with leading entertainment brand consultancy Troika, whose other clients include Netflix, The CW, Disney, and Nickelodeon, BYUtv's new branding reflects its mission to entertain, inspire, uplift, and improve families and communities. Tweens, teenagers, and their parents are at the core of BYUtv's focus. "We have created a variety of purposeful and engaging programming – everything from comedy and feel good to adventure and competition – all of which can be enjoyed in a co-viewing experience," said Jeff Olsen, creative director of BYUtv. "Our new tagline, 'together,' embraces unity and connection without defining what that might look like for individuals and families. We have a new look, new messaging and new programming that truly manifests in inspiring, audacious, and vibrant content." With family at its core, BYUtv—a non-commercial, value-based television network—brings an inspiring, uplifting, and entertaining experience into 60 million homes across the nation. Whether you’re crying or laughing at the kindness pranks pulled on Random Acts, rooting for your favorite team as they compete for $50,000 on Relative Race, or yelling out the correct answers during our newest game show, Battle of the Ages—BYUtv has a place for everyone. Grab your loved ones, pop some popcorn, and get ready to watch a wide assortment of programming flavors your family is sure to enjoy—together. What happens when Dwight, a twenty-first-century teen, falls into an ancient underground chamber and accidentally awakens a warrior princess and her hordes of enemies? In our newest scripted comedy show, Dwight in Shining Armor, witness the worlds of modern chivalry and medieval mayhem come crashing together in perfect chaos. Watch Dwight in Shining Armor on BYUtv. In an exciting series that combines a cooking competition with a game show, two families face off cooking their very best meals before the clock ticks down, while periodically getting interrupted to play delicious (and devious) games. When the families present their meals, the judges will have to decide which Dinner Takes All and who will be going home with $10,000! Watch Dinner Takes All on BYUtv. In this race unlike any other, four teams take a ten-day journey across the country to discover new relatives and compete for a $50,000 grand prize. Using the contestant’s DNA as a roadmap, this first-of-its-kind, genealogy-based reality show is all about meeting family, completing challenges, and racing against the clock! Watch Relative Race on BYUtv. Experience BYUtv live in HD TV on Dish Network, DirecTV, and 152 cable systems in the United States. You can also view our on-demand programming via BYUtv’s digital platform which includes apps for iOS, Android, Roku, Apple TV, Amazon Fire TV, Chromecast, Xbox One, and Windows Mobile. Established in 2001, BYUtv is a cable television network owned and operated by Brigham Young University in Provo, UT. And psst! Don't forget to visit BYUradio.org to see their new logo!